. 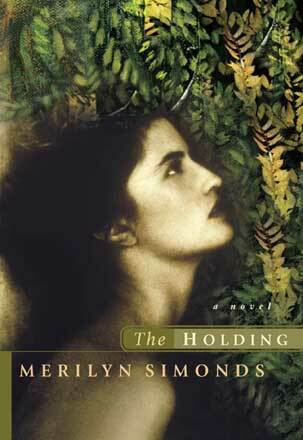 The Holding | Excerpt . It was early June by the time Alyson uncovered all that was left of the collapsed building. Two rows of logs were still intact, and where the spill of stone protected the wood, she found part of a third and a fourth. Shielded from the weather and the creeping vegetation, the timbers there might have been laid yesterday, the edges were that crisp, the chinking still firmly in place. Standing in a gap in the logs where a door might have been, she imagined the view cleared to the water. She envisioned chickens in the yard, a cow browsing among the trees, a chopping block by a stack of cordwood. A neat garden with a wattle fence against the rabbits and the deer. A footpath to the stepping stones and her flat boulder in the stream, the perfect place for dipping buckets. She could almost see the water sloshing to the ground, splashing a woman’s skirt. I’ll restore what I can, she thought. The work was invigorating. She no longer woke in the mornings to that crushing dread or what had come after – an undifferentiated pain that made her think she must be ill until she remembered and then she’d bury her face in the pillow, willing herself back to sleep. Now, she got up with an eagerness that surprised her. Some days she almost felt good. She still spent most of her hours away from the house, but her excursions seemed less an escape than a journey she looked forward to. Before she left, she rubbed citronella on her skin, tucked her long sleeves into gloves, pulled a bug net over her head. Sometimes she even thought to pack a lunch. And when she returned in the evenings, if she felt up to it, occasionally she prepared a meal. The rest, she left to Walker. She had grown used to letting things slip, knowing that he would see to them. The cradle, the quilt, the row of Polaroids – all the baby things had disappeared. The bed had been returned to its place in front of the window. The standing half of the Manitoba maple had been cut down, the limbs sawn into lengths and stacked in the woodshed. The twigs and small branches that littered the lawn had been raked into a pile and burned. For days he’d worked to clear the fallen trees and smooth the ragged wounds of the limbs ripped off by the weight of ice. He had done the work without complaint, though in the nights, when she was restless, he would leave their bed, too, sitting with her on the couch, his arm a clamp on her shoulders, his questions heavy in the air. Why won’t you talk to me? he’d say. And, What do you want from me? What more can I do? Then, Fine, I’ll leave you alone, if that’s the way you want it. Let me know when you decide to snap out of it. Through it all, she said nothing, paying attention to the faint whisper that told her to keep herself apart, raise a shield around herself, though if you asked her why?, against what?, she wouldn’t have known what to say, since it wasn’t a thought or even a feeling so much as an urge, the same sort of thing that had told her to push the baby out, cradle it to her breast. After a while, he’d given up. He started sleeping through the day and working through the night again, so that, by the time she found the remnants of the cabin, they were back to their old routines. When she left in the early morning and when she returned as darkness fell, she could see his shadow in the barn-door window, always in the same position, as if he’d grown rooted to the spot, forever reaching up to something just outside her field of vision. But even that was something she noticed only in passing. Her brain, idle for so long, was given over to her project, devising strategies, identifying tools, imagining the cabin, the height of its walls, the placement of its openings, until it seemed to her as substantial a piece of architecture as the house in which she lived. She cleared a path from the cabin threshold to the stepping stones across the stream, cut back the underbrush from around the low rim of logs, and raked the earth bare within. She piled the stones at one end and brought an old wooden chair from the shed, so that when each phase of her work was finished, she could sit in front of the makeshift hearth and stare into the non-existent fire, trying to think what else to do. She was prying out a piece of chinking – she had the inspiration that if she could figure out how it was made, she could reseal what remained of the walls – when she spotted the edge of something soft. She pulled on it and a rag slipped out. Behind it was another, cleaner than the first. She picked out more of the loose chinking, more scraps of rough, grey cloth, then reaching deeper between the logs, she touched something smooth, thin but rigid. A thing with weight to it that she pinched out of the narrow gap. A fold of clean white cloth wrapped around a leather bag. Inside that, a book. She lifted the cover. The pages were brittle, the colour of strong tea. When she touched them with her fingers, small bits broke off the edges. She slid the thin blade of her pocket knife between the leaves, lifting them up just far enough to read. It was a cookbook, the rules for rising steamed puddings, instructions for roasting caribou, the seven types of stains and how to remove them. The sort of old-fashioned manual of household management she’d often picked out of the boxes of books that Renata’s parents sent twice a year, eccentric, worthless volumes culled from the overburdened shelves of their used bookstore in the city. The pages in the middle were too parched to separate, even with the knife, so she turned the book over and opened it from the back. Bits of dried leaf and stem spilled onto her lap. She picked them up, peering at the veiny texture, trying to identify what they’d been. I am a woman Alone in all the wide World. Until today I had three Brothers, William Wallace, Robert Bruce, Harry Douglas, named for good Scots heroes, every one. Margaret the Queen, they called me. Now the Queen has taken her Revenge.